There is but one driver who can make the press room (well, the better chunk of the press room that follows V8 Supercars, anyway) giddy, and it's Shane van Gisbergen. Best of all, he'd like to come over to the United States to do more sportscar racing, and may do some more racing with the Blancpain series, too. 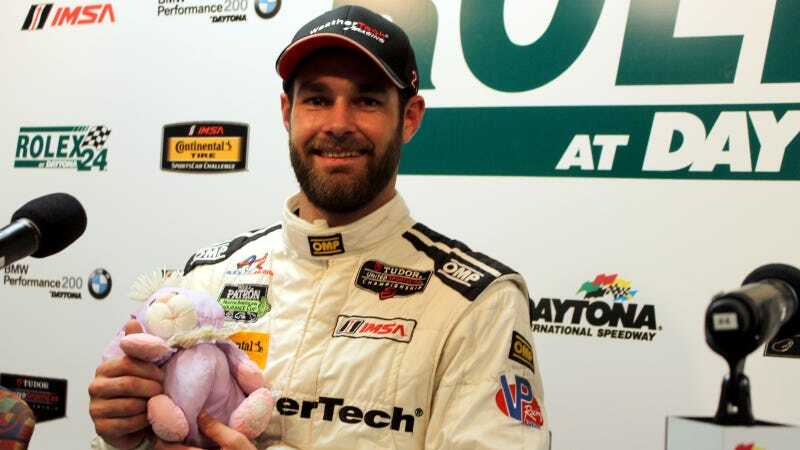 After his stint in the #22 Porsche 911 GT America, he dropped into the press room to answer a few sleepy questions and give my 24 Hours of LeMons team mascot a hug. So, in the "today I learned," endurance racing edition: his car has an alert that tells him when faster traffic is moving up behind him. Tech has moved past mere use of mirrors and that's pretty cool. Only problem: apparently racing at night really sets off this alert like crazy. Whoops. It's a good thing the Porsches have such nice visibility, then. Spencer Pumpelly was impressed with his Cayman in the Continental Tire Sports Car Challenge enough to mention that "it has great visibility, unlike other cars I've driven" in his stop by the press room yesterday. No clue which car he might be talking about there, but I'd like to nominate Pumpelly as this weekend's King of Shade. Back to van Gisbergen: yes, we want more SVG in the United States. Make it happen.